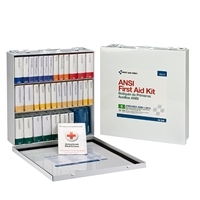 Business First Aid Kits - First Aid Stations and First Aid Cabinets at low prices. Choose from our fully stocked first aid kits for business, schools, construction sites and workplaces to meet OSHA requirements for first aid kits in the workplace. Choose from our Smart Compliance First Aid Stations that guarantee compliance to our standard 2, 3, 4, or 5 Shelf Industrial First Aid Stations. Our Workplace first aid kits are a great option for general business looking to be first aid compliant.